I’ve really been looking forward to seeing L’orchestre d’hommes-orchestres at The Theatre Centre. The last time I saw LODHO in Toronto was three years ago and they were playing the music of Tom Waits. I’ve been waiting ever since to see them again. It was worth the wait. Cabaret brise-jour features the music of Kurt Weill and the inimitable style of LODHO – an unexpectedly beautiful match. LODHO makes music that you have to watch and there’s so much happening on stage that it’s impossible to see everything. It’s like an art exhibit that you want to see more than once. At one point I thought that I was looking at a surreal painting. And then there were times that I felt I was watching choreographed pandemonium. Tonight Megan came with me to see the show. She was supposed to come three years ago but had a sick kid. I’ve wanted her to see LODHO since I first saw them in 2010. She loved them too. LODHO is an artist run collective. They formed in Quebec City in 2002. This year Robert Lepage – the 2013 Glenn Gould Prize Laureate – chose LODHO to receive The City of Toronto Glenn Gould Protégé Prize in recognition of their fascinating and ingenious work. Lepage will present the award at a special performance of Cabaret brise-jour on Saturday March 29 at 2 pm. There are still some tickets available although they probably won’t last long after tonight’s show. The set is supposed to be a high-society salon in the early 20th century. To me it looked like an art installation filled with things that wouldn’t normally go together. When we arrived the eight members of LODHO were lounging quietly, waiting. That’s the last time they’re quiet until intermission. The lights dim, a woman stands up, moves to a microphone, dons a pair of antlers and we’re off on an extraordinary evening of music, theatre, and art. Even when someone isn’t singing or playing an instrument – traditional or fantastical – they’re doing something. During one song one of the men painted his nails bright red. One of the women speared an apple with a sword and started eating it and then offered it to the woman who was singing. During another number the man with the red nails took the jewellery off one of the women who was singing and put it on himself. During the next number one of the men traded clothes with one of the women. Later two of the men exchanged clothes. After that they all threw clothes at one of the women as she sang. By intermission the stages was strewn with abandoned clothes and playing cards (from another number). When I first saw LODHO in 2010 I was amazed by the things they used to produce music – “A turkey-baster, a saw, teacups, dominoes, frying pans, a step-ladder, a banjo and spaghetti to make a snare drum, bottles as wind instruments, a suitcase as percussion, balloons, kazoos, a golf club…” In this show there aren’t as many instruments of opportunity; these are more ‘manufactured’. A treadle sewing machine vibrates a child’s rocking chair to add vibrato to a singer’s voice. For a few seconds I thought that playing a lunchbox produced a warm jazzy sound and then I realized the lunchbox had been adapted. Megan said something about “the cornet in the lunchbox” later when we were talking about it. But that was okay, for a few seconds I got to believe that a lunchbox made beautiful music. And later I learned that you can produce something very impressive with turkey basters, plastic tubing, and recorders. There were a couple of times when I felt quite uncomfortable. There’s a darkness underneath the humour. It’s part of LODHO’s gift that they move you out of your comfort zone and you still enjoy their performance. It’s layered and you can choose how deep you want to go. Sometimes after Megan and I see a show together she turns into theatre-geek extraordinaire. It really drives home how differently someone who studied theatre sees a performance. Tonight was one of those times and she had a lot of interesting observations and comments, she saw things I would never have noticed. I hope that she’ll write a lovely long comment after this review and talk about the female and male roles and the precariousness that was part of the show. There are five more shows. 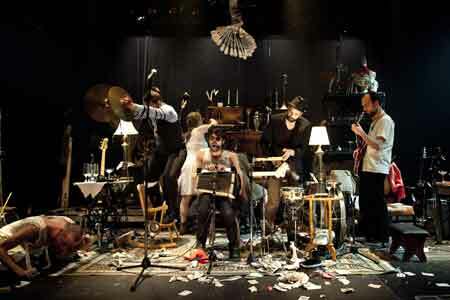 If there’s any way that you can mange it, go see Cabaret brise-jour – L’orchestre d’hommes-orchestres. It’s an experience unlike anything else, performance art meets concert meets play meets art installation.